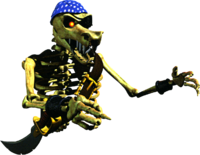 Kackles are undead skeletal Kremlings that only appear in the level Haunted Hall of Donkey Kong Country 2: Diddy's Kong Quest. Like with normal ghosts, Kackles hover in the air to move around. Every Kackle wears an eyepatch and a bandanna. 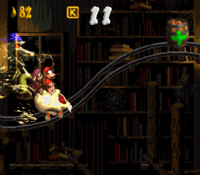 Kackles are absent from Donkey Kong Land 2, as the game does not have its own Haunted Hall variant, in favor of a generic rollercoaster level, Krazy Koaster. In Haunted Hall, there are four Kackles. Each one has a uniquely colored bandanna, and are encountered in an order from: blue, green, yellow, and lastly purple. In the Game Boy Advance remake, every Kackle wears a blue bandanna like the first one. Each Kackle has its own "zone", a section of the level where the Kongs enter through a gate and exit from out another. When Diddy and Dixie enter a zone, a timer appears at the top of the screen, and the Kongs have to speed through the zone before it runs out. If that happens, the Kackle becomes tangible and injures the lead Kong. Kackles cannot be defeated. Nearly every zone takes longer to pass through than what the timer is set at. As a workaround, the Kongs must use Plus Barrels to increment the timer and therefore prevent the Kackle from attacking them. Diddy and Dixie must also avoid the antonymous Minus Barrels, which take away from the timer. The first Kackle area contains mostly Plus Barrels and a few Minus Barrels. The second Kackle area only contains Plus Barrels. The third Kackle area only contains Minus Barrels, but the timer will be longer than normal to compensate for the lack of Plus Barrels. The fourth and final Kackle area has Plus Barrels and Minus Barrels often placed near each other, requiring the Kongs to time their jumps just right to avoid the Minus Barrels. The first two Kackles appear before the Star Barrel, and the other two appear afterward. Each zone progressively becomes more challenging as the Kackles become more difficult to avoid. According to the end credits, Kackles are classified under the "Kremling Kuthroats" class. According to the game manual, Kackles are said to haunt many locations on Crocodile Isle. Despite this, they are only seen in one level. In Donkey Kong 64, a demon resembling a giant skeletal Kremling appears to pursue in a Mine Cart segment, similar to Kackle. This page was last edited on April 4, 2019, at 00:07.